The Dublin Core metadata standard is primarily for the benefit of archivists and librarians. It is the minimum set of metadata needed to adequately archive and find relevant material. Dublin Core is widespread among archivists and Premiere Pro CC reads Dublin Core metadata via the XMP metadata panel. 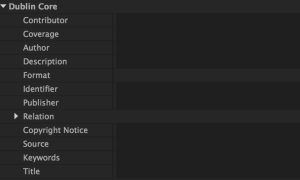 Neither Final Cut Pro, Final Cut Pro X or Media Composer read, or write, Dublin Core metadata. Although Media Composer doesn’t read Dublin Core metadata it could be added by formatting the Dublin Core into a tab-delimited ALE file, and import the ALE to Media Composer. Batch import the media files to the same bin and the metadata will be merged. Because Dublin Core has extensive use by archivists it’s very likely that you will need to be familiar with it at some point in your career, but it’s not something you’ll use in daily postproduction. 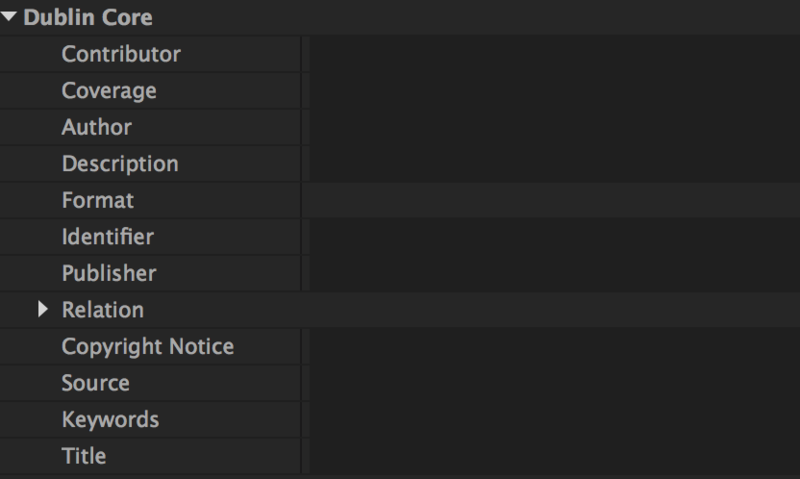 There’s currently no simple way to export from any NLE to Dublin Core metadata. Dublin Core export or import could be an opportunity for a third party developer when there is a demand.